This week, Verizon stopped allowing new customers sign up for an unlimited data service plan. The timing just so happened to align with the announcement of the latest generation Droid phone. The big fear for the lucky Verizon users who currently have unlimited data was whether or not their unlimited data would transfer over to a shiny new 4G LTE device. The answer: yes. 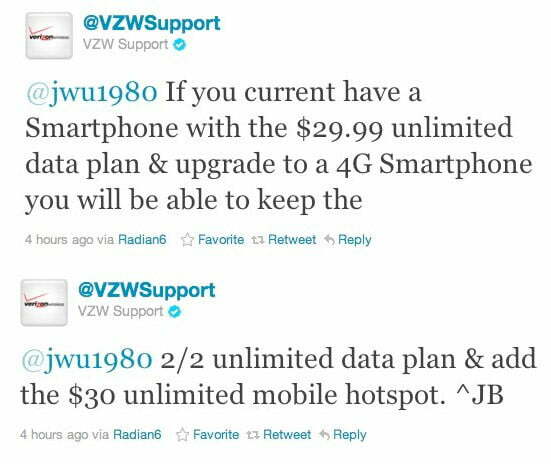 Today via an official Verizon Twitter account, the company confirmed that if you currently enjoy unlimited data on your 3G Verizon phone that the you will keep the same data plan if you buy a new 4G LTE device. Verizon has been fairly generous thus far with its LTE network; all three LTE devices were launched with the unlimited data option. With how fast Verizon’s LTE network has proven to be, it seems as though 4G users would be able to eat through a limited data plan very quickly. The question now is, does this mean the next iPhone will be LTE? Verizon offered the iPhone 4 with unlimited data, even after AT&T stopped offering it, and that was one of the selling points for new users to switch to Verizon. With all signs pointing to a September announcement for the next generation iPhone, the question still remains whether that phone will offer 4G. If it is, current Verizon iPhone early adopters will be able to breath easy knowing their unlimited data plans are safe.